At least we'd get them! So set up a separate crowdfunding organisation and commission Dapol/Bachmann/Rapido to do the production. Reduce the risk by taking money up front, to be refunded if the project fails to reach its funding target. Dapol dont seem to get it. Another manufacturer, DJM, crowdfunded their OO class 71, based on a limited number of liveries and running numbers and a set number of each versions on the promise that these would not be available afterwards. i think it was 250 of each of 4 versions made. Having sold them, DJM then went on to issue other models, with weathering and as shop special editions, with different running numbers. Annoyingly the shops have cut the prices on these so that my crowdfunded model now seems expensive, but i wanted to get it off the starting blocks, which i did do. 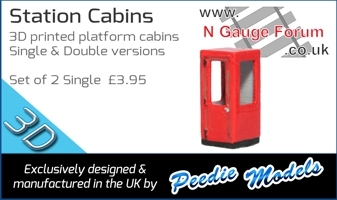 Its also similar to the NGS producing a model with Bachmann, like the Queen Mary or the Inspection Saloon, to part pay for the dies and to get exclusivity for a while, but after two years, Bachmann can then sell other variants. OK that's not crowdfunding but what i'm trying to say is that there are loads of different business models for releasing models and i think Dapol have just got their head in the sand on this. Or perhaps their cyclop's eye is on O gauge now. If there is a crowd funding project for a WC/BoB count me in! I do think Dapol have lost the plot on this particular model. It would be easy for them to sell multiple models to individuals (like me!) just by supplying a sheet of decals for alternative numbers like the PECO Jubilee had. I'm not at all surprised that several people here had multiple models on pre-order, you can't do post-war Southern without them, they were almost ubiquitous! Certainly seems to me that the WC/BoB of all steam prototypes currently unavailable RTR in N has the biggest potential to succeed. Agreed, no Southern BR layout would be complete without them and with so many in preservation it adds further potential in later eras. Put simply it feels like a bit of a no brainer, but with Dapol hedging their bets it will be a risky one to be sure. Canny on their part but not really in the best interests of the hobby arguably. Dapol have ruled out crowdfunding themselves but maybe a retailer could step up with a commission. Osbornes perhaps, given their focus on N Gauge? My thought would be staged crowdfunding a draft model below. My bet would be once cad is produced dapol would get themselves back into this. Also to me (sorry in advance Ben and co) this would be the easier one for revolution to take on in the air smoothed form due to simpler outside motion. The first challenge would really be to find someone with the cad skills and the potential manufacturer. I'd also agree the first batch should be limited in choice at reasonable price to subscriber with future non subscribe versions being more expensive. On this basis I actually wonder if a commission via bachmann may work and I wonder what that cost would be. That said I would envisage once signed up they'd expect to see it through to completion even if dapol started up again. Which brings us all back to the frustration of what dapol did and that they shelved this (and all steam projects) but developed the schools which was announced after and had less development on when the changes team occurred. I don't understand the decision to do the Schools over the Bulleids either. Dapol are probably wondering why sales of it are a bit disappointing, possibly... I must admit I'd like to meet their marketing people, some of their decisions do seem rather strange, and always have done. The Class 22 diesel for instance is a very nice model (I have one) but it was never going to be a big seller, and it seems that even the big retailers struggle to shift them. I wouldn't actually be too bothered if a manufacturer produced runs post-crowd funding that were a bit cheaper. I'm fed up with not being able to model the late 60s Southern with any authenticity. You can't renumber a Bachmann/GF Merchant Navy as a WC/BoB (either type) IMHO, it just doesn't look right to me. I've had to become a 'transition era' modeller with a growing collection of diesels because the rolling stock is more or less the same! IIRC Dapol had technical issues with the WC design, which used a loco-mounted motor rather than the tender drive used in the Schools. IIRC it wasn't on the original design for WC that decision for non tender drive was announced (which was for all tender locos) after mgt change and before school was developed further. Longbow - That's interesting. I'd have thought that the Spamcan would have been just about the easiest N-Gauge prototype to do a loco mounted motor - it's basically a box on wheels with no complex valve gear - could possibly understand issues with a rebuilt version. I don't have any real issues with tender drive, particularly if loco drive is going to stop models coming on to the market! Just to add 110 of them were originally built, was there a more numerous Pacific class or express loco class in the UK? Leachsprite4 - Yes, The Southern Region had the 2nd highest number of Pacifics after the LN(ER). Modelling the Southern Post War without light Bulleids is a bit like modelling the roads network in the 1970s, but leaving out the Ford Cortinas! Being more positive dapol wanted a coreless motor in it so the question is does the class 68 have a coreless motor in it?